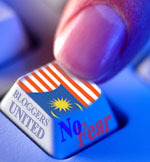 Posted by elizabethwong in "We can do better", Current Affairs, Democracy, Huh? !, Malaysia, Politics. The end of the year is fast approaching. It appears that politicians and all their ilk can’t stop gabbing, hoping to hang on to the ebbing twilight of 2008. “The Sultan is disappointed with the actions by some irresponsible people for exploiting children in their campaigns or demonstrations. At the start of every Exco meeting, the MB would relay to us some pertinent points raised during his weekly tete-a-tete with HRH Sultan of Selangor. Last Wednesday, the issue of Jerit was brought up. We were informed that HRH was concerned, and advised us if possible, not to involve children. Not once was the issue of punitive action brought up. There was no laying down ‘the law’ or that there must be punishment etc. From our extremely limited dealings with HRH, the impression given was that he was for reasonableness, not one hell-bent on punishing this or that person. PKR and DAP should make their stand on PAS’ goal to implement hudud law should the Pakatan Rakyat win in a general election, MCA Youth Chief Datuk Dr Wee Ka Siong said. If Wee bothered to do his study before blabbing, he would know PKR’s and DAP’s positions are not for Hudud, and that Wee’s own party MCA hid in the corner nibbling on some stale cheese when UMNO via Dr. Mahathir declared Malaysia an Islamic state. “When the state is governed by another party, then there is a difficulty in the chain of command. There is a set SOP (Standard Operating Procedures) when it comes to disaster response. Surely you should know the answer to this. In fact, this was the first set of documents all Exco received when we entered the Selangor state office. Perhaps in the past, it was easy for UMNO/BN Federal government to make life difficult for the one lone Opposition state i.e. Kelantan. Time to grow up UMNO. Start operating like a government, not some partisan-centric-frog-under-coconut-shell party. Get over it, or get out public office, please. Posted by elizabethwong in Bebal-ism, Democracy, Economy, Environment, Huh? !, Human Rights, Malaysia. My office has been on a state of high alert to receive the initial assessment report on Bukit Antarabangsa today. I even cancelled my working trip to Singapore just to be in office to go through it. But …. Public Works Department told us that the Selangor Government can’t have a copy of the report. Six pm came and ran off; we’re definitely not going to see it. This is a disservice to the residents of Bukit Antarabangsa, and yet another good reason why there should be a Freedom of Information Act (not just a state enactment) in this country. Today, the Selangor State Government should have received a copy of the initial assessment report from the Public Works Department, including that of the potential geo-hazardous zones, of the landslide-affected areas at Bukit Antarabangsa for the state’s own study and assessment on the integrity of the hillslope and its surrounding areas. With the said report, the Selangor state would meet with the residents on Friday morning 10 am, to make public the report and to convey the options that would be available for the affected residents, including whether or not they would be allowed to return to their abandoned homes. This pledge was conveyed to the residents during a closed-door meeting with affected residents and families of the deceased on Sunday, 14th December 2008, with the Selangor Menteri Besar, state representatives and the Public Works Department. Thus, it is of grave concern that the state has been informed that a Ministerial order has been given to deny the Selangor State Government of this initial assessment report today. Despite being informed of this fact this morning, we gave time for the Public Works Department and the Minister to reconsider their decision. Instead, we have been told that the information is only for the eyes of the Minister of Works and that only after the Minister makes his announcement, then would the Selangor state government be allowed to view the report. It is further disconcerting to be informed that one of ‘reasons’ given was that because the report was funded by the Federal Government, thus it would be for their eyes only until they ‘allow’ us to view it. I find this attitude is repugnant and disturbingly partisan. Both the Minister and the Selangor State Government have a right to the information contained in the initial assessment report compiled by the Public Works Department. We are equally as anxious as the residents to ascertain the safety of Bukit Antarabangsa considering it may affect thousands of people and the future of development in the area. Instead of wrangling who should read it first, one should reason that the report should be available to both the Federal Minister and the State Government. I urge the Minister of Works to release the report to the Selangor State Government without further delay so that we are able to have enough time to study the report and to honour our collective pledge to the people of Bukit Antarabangsa. Selangor Menteri Besar Abdul Khalid Ibrahim is disappointed with the Public Works Department over its decision not to hand over the Bukit Antarabangsa landslide report to the state government. This has resulted in Abdul Khalid not being able to announce the next course of action as scheduled tomorrow. According to sources, PWD revealed its decision on the matter to the state government this afternoon. However, the department did not provide a detailed explanation as to why it decided as such apart from stating that “there were too many implications” if the report is handed to Abdul Khalid. Sources said the menteri besar has expressed ‘puzzlement’ over the decision. Previously, during a dialogue between the menteri besar, PWD officials and Bukit Antarabangsa residents, the department had promised to hand over the report so that proper follow-up action could be taken by the state government. It is believed that Works Minister Mohd Zin Mohamad would announce the report tomorrow after it is tabled before the Cabinet. The massive landslide in the Bukit Antarabangsa area on Dec 16 left four people dead and destroyed 14 bungalows in Taman Bukit Mewah and Taman Bukit Utama. Following this, Housing and Local Government Minister Ong Ka Chuan said there were no indications of human negligence as the cause of the incident. Posted by elizabethwong in Economy, Environment, Malaysia. One of the earliest policy announced by the new Selangor State Government after the March 8 General Election was to ban any development on Class 3 and Class 4 hill slopes. This would mean that no development could be carried out on hill slopes 26 degrees and above. This decision was heavily criticised by the developers and their association. The state government was accused to be hostile to development. Citing that land is already scarce in Selangor, the developers argued that there would be no more land to be developed in a few years time. However, the recent tragedy in Bukit Antarabangsa had silenced these critics but with four deaths and thousands displaced, it is inappropriate for the state government to brag that they are correct to impose the ban. A government should do what is right and not what is going to be popular. The same thing goes for the current crisis in Bukit Antarabangsa. The experts have announced that almost 2,000 people need to be evacuated as their homes are unsafe. If further reports confirmed that these homes could never be made safe then a decision on the future of Bukit Antarabangsa must be made. Even if this would mean demolishing these homes or closing down certain parts of Bukit Antarabangsa, the state government must do what is right and not what is popular with the people. Allowing the people to move back into their homes and announcing that they are safe would be very popular but what is the point if this tragedy would repeat itself in the future? Ministers, deputy ministers and VIP’s would visit the site, make sympathetic statements and pose for the cameras but at the end of the day, the state government, the Menteri Besar and Excos, would be burdened with the decision making. The people should brace themselves for the worst as this decision would be based on the safety of the people and not on the winning of elections. Posted by elizabethwong in "We can do better", Economy, Environment, Malaysia. One of the earliest policy decision made by the new Selangor state govt of Pakatan Rakyat was to throw out any housing and building applications on Class 3 and Class 4 hillslopes, in order to preserve environmentally sensitive areas and prevent the recurrence of landslides. This was decided on April 2, 2008 Executive Council meeting. Selangor became the first and only state in the Federation to have complied with the Federal Town and Country Planning Department’s “Total Planning Guidelines” 1997 (2nd edition, 2001) which states that no housing development should be allowed on 25 degrees and above gradient slopes. Developers thought it was a late April Fool’s joke. Since our ban, they have used all means – the media, blogs, lobbying of ADUNs and MPs etc. to change of our minds. We were labelled and villified as “anti-business” and “anti-development”. I have even had some of our Pakatan MPs asking us to make exceptions for Class 3. I was told they particularly disliked me and called me “lan-si” (very ‘action‘) just because during a public meeting of developers, NGOs, residents and the Exco, one of the key developers questioned how could the state government stop hillslope development, and I answered, “Because we can…”. And none were too happy when I had to repeatedly and literally wave the ‘Total Planning Guidelines” book at them. And every couple of months, we have to repeat our policy decision again. Even as recent as last month, developers were insisting that they had theright to develop hillslopes and some had told a couple of ExCo members that they were planning to sue us. One of them said we would have to compensate them RM 330 million (25% of our state budget) of possible loss of profits. Imagine the pressure of a lobby group whose combined income and assets dwarfs the state government. Saturday’s tragedy proves the correctness of the decision of the state government. But vindication which comes after loss of 4 lives and more homes is unspeakably bitter. There are some 5,000 residents living within the vicinity of the landslide who face uncertainty and possibly have to vacate their houses. We ask that developers to stop pursuing and pressuring us to review our policy, and instead they should be thoroughly go through every single technicality of their existing hillslope projects. While Ikram and Public Works department will be charged to pinpoint the cause of the tragedy on Saturday, the state government will immediately review all approved hillslope projects by the previous administration, standing or partially constructed. Those, which there is no construction yet but approved previously prior to March 8, 2008, should not be allowed to proceed, especially along the same range of Bukit Antarabangsa and Ulu Kelang – which should include Taman Hijau and Bukit Melawati. We had come too late. Many of the hillslope projects have already been standing for a number of years, some were half completed when we came into power. Without proper maintenance of slopes and drainage on these private lands, tragedy will strike after many years, always after the period of indemnity is over. Those areas which are shown to be prone to landslides such as in Ulu Kelang which as far back as 2005, the Public Works Department had already flashed its red card, more stringent conditions will be imposed on already existing housing projects. All developers and private land owners have to protect and reinforce their own hillslopes if they want to continue to prosper, own property and do business in Selangor. We have recently received complaints from Ampang, Kajang, Cheras and Pandan where private land owners and developers have neglected to protect their hilslopes and there are already signs of wear and tear. Some put plastic sheets and some said they were bankrupt, those they don’t have to funds to repair their slopes. Whatever. If they do not do the necessary, we will blacklist them in the state and beyond. We ask that ‘People’ be put ahead of ‘Profits’. We heartened that finally, after 8 months of battling the housing industryalone, that the Federal Government has come on to our side to give Selangor, both the moral and policy support it needs, with both the PM and DPM calling for all hillslope development permits nationwide to be cancelled. We can only hope Federal government doesn’t forget after 3, 4 months, December 6, 2008 will not be forgotten – like what had happened in 1993 (Highland Towers), 2002 (Tmn Hillview) and 2006 (Kg Pasir – which was less than a km away from Saturday’s landslide) and the lives lost, both yesterday and in the past will not be in vain.